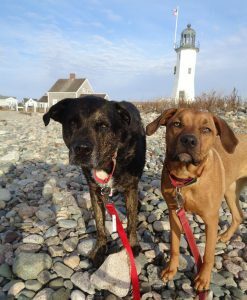 So since the recent theme of our Adventures have included Lighthouses I decided to feature a photograph of Buster and Shadow that was taken at the Scituate Lighthouse, one of the most gorgeous lighthouses in New England. They are posing well, smiling regally, and capture a special memory of a scenic Adventure with my boys. If you view my blog you can read more about our Adventure at this location under the Massachusetts section of my blog. Do not miss a chance to visit this location! Talk about good timing for that picture! Your dogs are such great models! Aww! Well thank you…I appreciate it! They enjoyed this spot! Great picture of the furry ones.